Time for clean air and climate action in Utah! 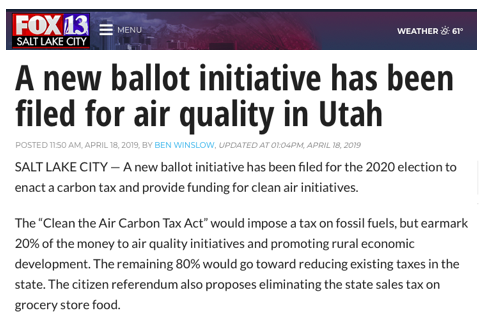 I’m part of a group (Clean the Darn Air) that’s trying to put a clean-air-and-climate measure on the 2020 ballot in Utah. Read about it on Fox 13 or in the Salt Lake Tribune. More soon! For more information or to get involved, check out our hot-off-the-presses website, CleanTheDarnAir.org or email me at yoram@standupeconomist.com. 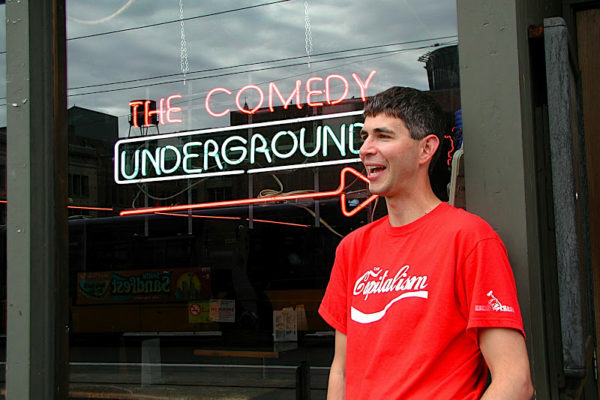 Check out my latest video, filmed at the Humor Session at the Jan 2019 annual meeting of the American Economic Association. All together my videos have over 1 million hits on YouTube. 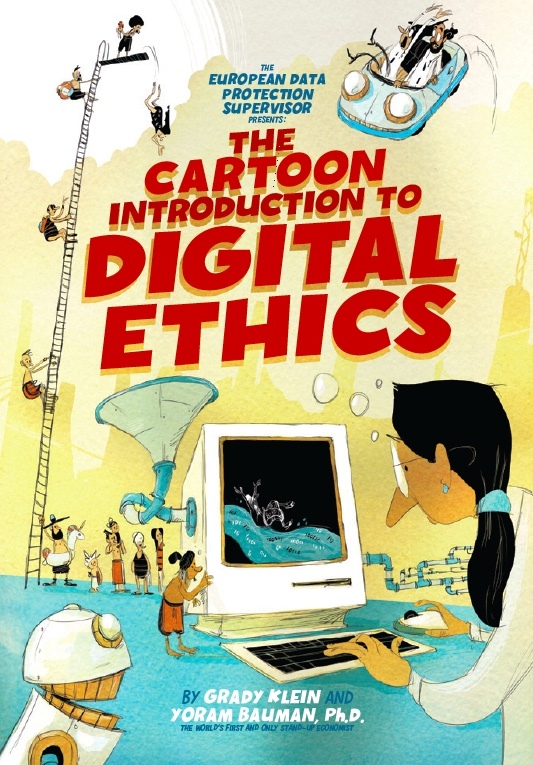 This 20-page Cartoon Introduction to Digital Ethics booklet (free download here, co-authored by Grady Klein and yours truly) was commissioned by the European Data Protection Supervisor for the 40th International Conference of Data Protection and Privacy Commissioners in Brussels in October 2018. I'll be doing a short set at the Marketing Analytics Summit at Caesars Palace in Las Vegas mid-day-ish on June 19, 2019! It will follow up on my (short) slot to open the plenary session at the PAW Business conference earlier that morning! Details TBA about a visit to the University of Georgia on W Aug 28! Tentative at Reed College in Portland OR on M Nov 4. Details TBD about an event (or events) tentatively planned in Oneonta NY for the week of April 20, 2020. In 2014 I was the “celebrity economist” in a series of videos for the newly redesigned Ford Transit Connect, a nifty van that’s customizable, maneuverable, fuel-efficient, and could be just right for your small business! I filmed a “Numbers Don’t Lie” 30-second promo video, plus the 90-second “Tomatoes” video you see here and four other 90-second videos: “Petting Zoo”, “Surf Shop”, “Salvage Recycle”, and “Roadside Rescue”. And FYI see also this ad starring Nobel laureate Thomas Sargent! 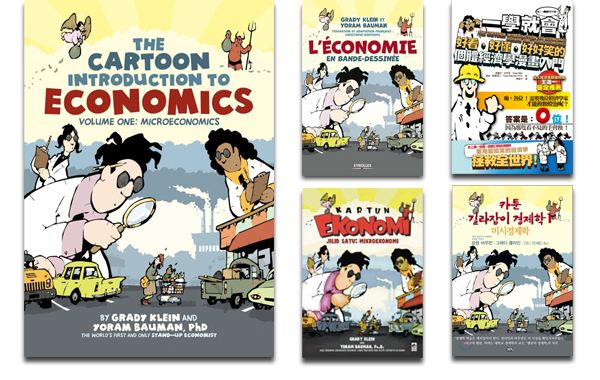 The Cartoon Introduction to Economics (Volume 1: Micro and Volume 2: Macro) is now available in 12 foreign languages! 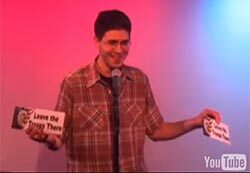 Check out my latest video, filmed at the Humor Session at the Jan 2016 annual meeting of the American Economic Association. (For more info see my collection of funny economics articles or the Virtual Specialized Issue of Economic Inquiry.) All together my videos have over 1 million hits on YouTube. My new Cartoon Climate book!